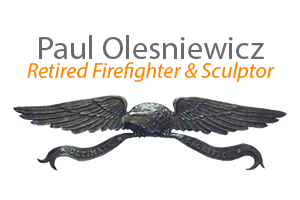 (Tucson, Arizona – April 25, 2017) Paul Olesniewicz has been creating bronze sculptures professionally for more than 20 years. 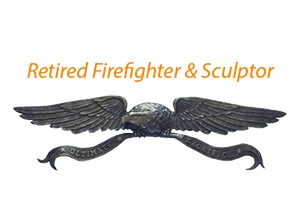 In that time Paul has created over 30 city and fire department memorials and has statues in two firefighter museums. Being a retired firefighter, Olesniewicz knows what it’s like to have his colleagues face danger in the line of duty, and has enjoyed contributing to part of the recognition for those in public service…and that makes his passionate work (and its quality) stand out. One of Paul’s highlighted work can be found in Phoenix, Arizona at the Arizona Fallen Firefighters Memorial. This project took the state over 20 years to complete which includes a bell tower, 10 life size bronze statues (five out of the ten Fallen Hero statues are of Paul’s making), and a granite wall with 119 engraved names to honer fallen firefighters and paramedics. 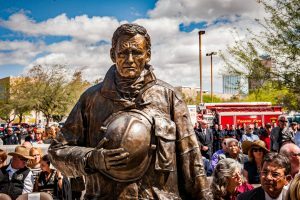 The Arizona Fallen Firefighters Memorial is in the Wesley Bolin Memorial Plaza, near 17th Avenue and Washington Street at the state capital in downtown Phoenix. 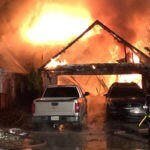 For more information about the memorial, visit their website azfirefightersmemorial.com. Over the decades Paul has become very talented in making bronze sculptures, and works closely with Metalphysic Sculpture Studio a local Tucson art foundry. 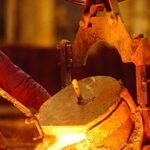 However a long time ago when he was just a young lade starting college he wasn’t the artisan we see today. Paul originally went to Northern Arizona University, which was Arizona Teacher’s College in 1965, and studied to become a pharmacist. Going through pre-med, Paul needed to fill in general education requirements, and looked into taking a sculpting class. In 1970, during the Vietnam War, Paul joined the United States Army. After his time in the service, it was 1972 and Paul needed a job. Olesniewicz soon went back to school and received his Bachelor of Fine Art Degree in 1978, from NAU in Flagstaff, Arizona. After graduation Paul moved to Tucson, Arizona to a job he knew well, firefighting. During his 27 years with the Tucson Fire Department Paul created a few sculptural pieces as a hobby, but it wasn’t until the mid 90’s when his passion for sculpting started heating up. 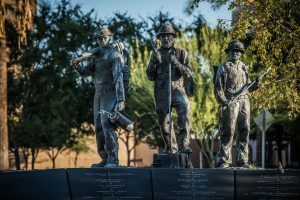 Local memorials can be found around the city of Tucson, one notably is the Tucson Firefighters Memorial which Paul designed and created 5 bronze statues. The statues include a life size Fallen Hero statue and a Last Alarm piece. This statue, Fallen Hero, is looking at a granite wall which is engraved with the names of local Tucson fallen firefighters. This memorial was financed by public donations and the sale of commemorative brick pavers that can still be purchased to continue the memorial maintenance. The Tucson Firefighters Memorial is located in front of Tucson Fire Station #1 300 S. Fire Central Place, Tucson, Ariz. 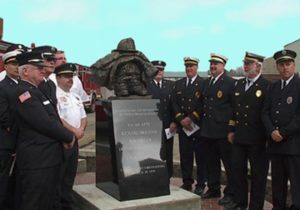 The Corry Fallen Firefighters Memorial was created in honor of five firefighters that lost their lives in one event on March 29, 1970. A Last Alarm Life Size statue was mounted on a granite pedestal in Corry, Pennsylvania in 2006. Sadly these firefighters were responding to a call on Easter sunday at a former Sherwin-Williams paint store when a fire born explosion killed the firefighters inside.